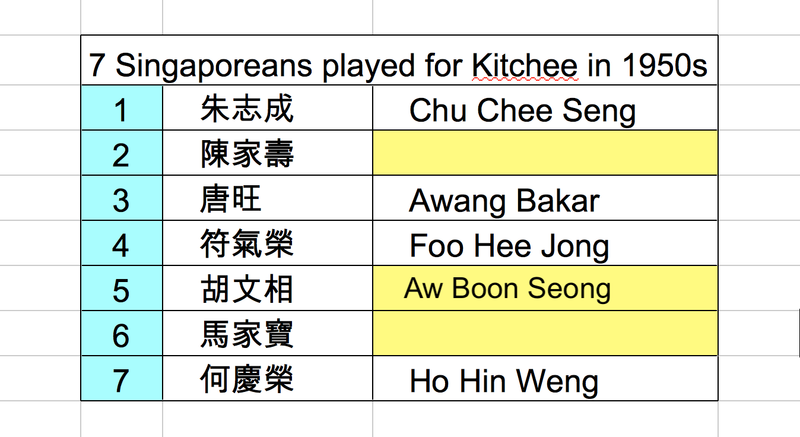 This is a follow up entry on the post regarding the seven Singaporean players who played for Kitchee SC in Hong Kong First Division back in the 1950s. "Hong Kong Football History Society", the Facebook Page that contributed the old newspaper clippings to the said entry back last month, posted a summary on the Singaporeans' debut in the then British Crown Colony on 12th November 1950. The summary was based on the match report filed by "The Kung Sheung Daily News" (工商日報) dated 13th November 1950. 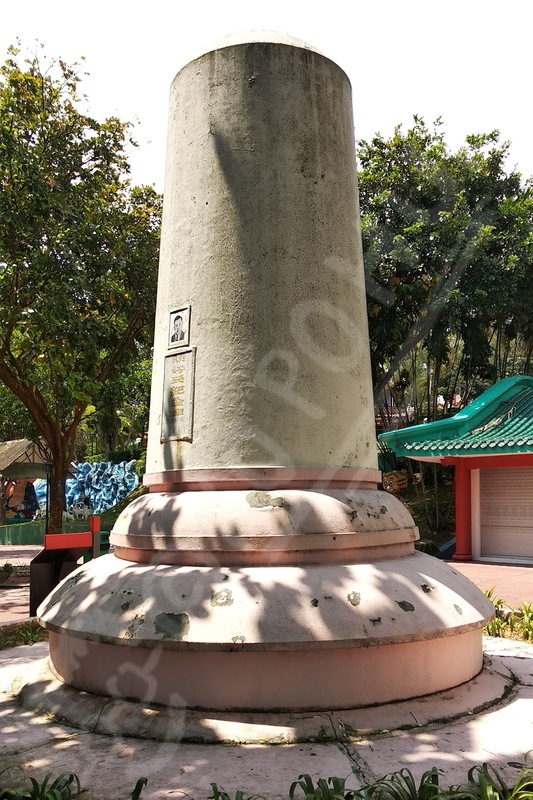 At the begining of the summary, it was revealed that the recruitment of the Singaporeans was the brainchild of the late Aw Hoe (胡好) of the famed "Tiger Balm" Aw family despite at that point of time he had already exited from the Hong Kong football scene and returned to Singapore in July 1950. "Not willing to see the defending 'double-winners' (Kitchee was both the league champions and Hong Kong Senior Challenge Shield winners in the previous season) fallen apart, Aw decided to invite Chu Chee Seng (朱志成), [... names of the rest of the contingent] to come to Hong Kong to play for Kitchee." said the summary. It added goalkeeper Chu was the most reputable among the seven of them for his distinction being one of the those represented Republic of China in the 1948 London Olympics Games and a disciple of Pau Ka Ping (包家平), a renowned Hong Kong custodian in the 1920s. Upon their arrival in Hong Kong on the 6th of November, the Singapore contingent had their first training session with their new team at the Hong Kong Football Club Stadium on the next day before making their debut on the 12th. The excitement surrounded the Singaporean players caused a sensation among the local fans. When it was announced they were due to make their first appearance against title favourites Kowloon Bus (KB) at Fa Hui Stadium, it was an immediate sell-out with some ticket holders were being denied entry after a "red flag" was raised for safety reasons. 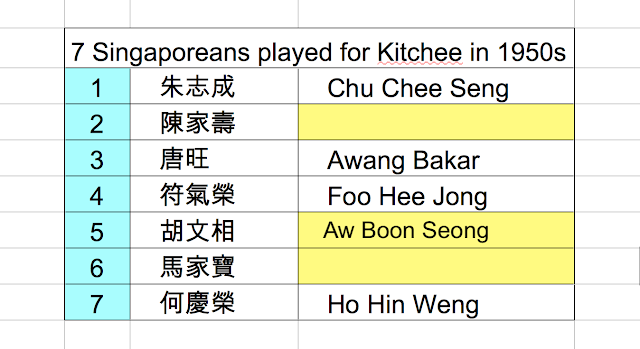 In the end, six of the newly-recruited players made their debut for the 4.30pm game with Kitchee took the initiative to fire the first salvo with Awang Bakar (known as "Tong Wong" 唐旺 in the local press) ballooned his attempt after received a threaded pass from the middle, swift reciporcal moves were made by KB shortly after only to be frustrated by heroics of Chu to ensure both sides headed to the dressing room on a clean sheet at the interval. The deadlock was eventually untied in the 57th minute with KB took the lead with an easy tap-in that triggered Kitchee to stage their own rounds of offenses which were futile. Things took a worse turn when Lee Chun Fatt (李春發) doubled the score in the 70th minute before Awang headed home from near distance to reduce the deficit five minutes later and pushed the game to a fever pitch till the referee signalled the end of the game with the score 2-1 in favour of KB. "Overall, Kitchee could not match head to head with Kowloon Bus despite having the Singaporeans in their line-up," wrote the summary in summing the match in Kowloon. "If not for the saves made by Chu Chee Seng, it would have been a bigger margin for the winning side." Apparently, Chu earned the accolade as the best performer for Kitchee on that November afternoon and suggested Kitchee's coach made a mistake to field six Singaporeans (except for Ho Hin Weng 何慶榮) at one go when they were not gelling up with the rest of the team who deployed a "man-marking" tactic unsuccessfully to counter a more fluid, short passing game favoured by KB. "Perhaps, having just arrived (in Hong Kong) and yet to establish an understanding with their new team mates, the Singaporeans were not able to show what they are capable of in this game in which Kitchee were struggling in the midfield with 'Tong Wong' (Awang) left stranded up front." added the summary. After a scoreless draw against Eastern in their next game, the Singapore contingent won their first match for Kitchee when they beat Kwong Wah in a 3-2 close shaver. 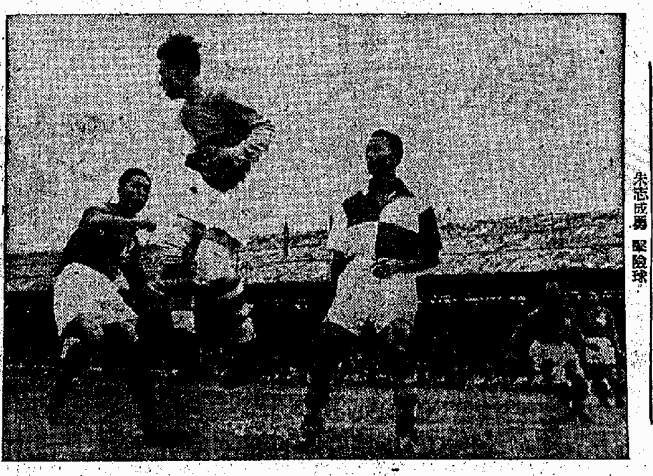 For their good showing in the league, both Chu and Awang were featured in a friendly match when they represented the Hong Kong League Selection in a 4-2 defeat to Swedish club Djurgårdens on 6th of December 1950. 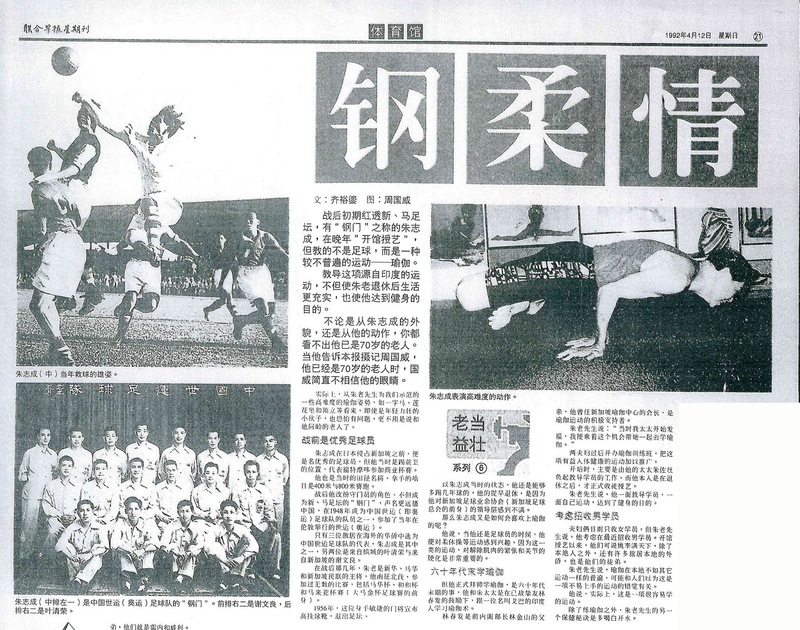 I would like to express my gratitude to Hong Kong Football History Society (香港足球史學會) for the permission granted to reproduce the two images of "The Kung Sheung Daily News" (工商日報) shown here and Mr Edmund Fung for his assistance in this entry as well.